We encourage you to share your organization's website with many other people – community members, partner organizations, and your own staff! Your organization's website will be more useful as more people know about it, and use it to interact with your organization. So tell people about your website! We also suggest adding your organization's website address to your organization's signs and letterhead. 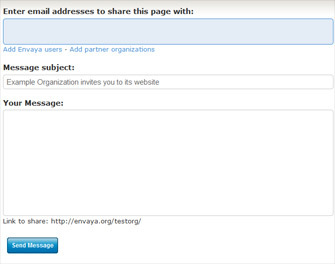 To easily add the email addresses for other organizations on Envaya, click Add Envaya users. (Note: This is only available after your organization has been approved by Envaya's administrators.) 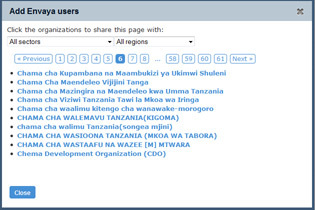 Then find the other organizations that you would like to invite and click on each one. Click Close when you are finished. You can also easily invite all of you organization's partner organizations to your website by clicking Add partner organizations.